SureCall signal booster for use in Canada and North America on any cellular service provider. Not for use within USA. 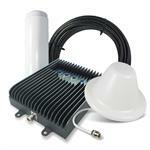 SureCall Force5 cell phone signal booster with kit for consumer use. SureCall Force5 2.0 Voice, Text & 4G LTE Cell Phone Signal Booster with Built-In Sentry Remote Monitoring for Large Buildings 25,000+ sq ft.
SureCall Force8 5G LTE cell phone signal booster for use in large building. SureCall Fusion2Go cell phone signal booster for vehicle, car,trucks, RV. SureCall Fusion5s and Fusion5x cell phone signal booster kit. SureCall Fusion5X 2.0 Cell Phone Signal Booster for large homes or office up to 20.000 sq feet area. SureCall Fusion4Home SC-PolyH-72-YP-Kit cell phone signal booster kit increases cellular coverage up to 3,000 sq. ft. for all carriers voice, text and 4G LTE data signals. SureCall Fusion5 five bands wireless signal booster kit boost 3G, 4G, LTE data signal and also deliver clear voice signal. Cellphone-Mate Fusion5 amplifier is ideal for home and office use. FCC certified for new regulations and technical standards. SureCall Fusion5s 4G LTE signal booster is designed for homes where cellular reception is weak. SureCall Fusion5s signal amplifier covers multiple users in areas that are up to 6,000 square feet unobstructed. SureCall Fusion5s 4G LTE signal booster is designed for homes where cellular reception is weak. SureCall Fusion5s signal amplifier covers multiple users in areas that are up to 6,000 square feet unobstructed. For us in Canada. SureCall Fusion5X signal booster, is designed for offices or buildings up to 20,000 square feet. The Fusion5X booster enhances voice, text and 4G LTE data for all North American carriers. SureCall's Fusion7 is a one of a kind all in one cellular, WiFi and HDTV booster solution for homes and businesses. SureCall FusionTrek All-in-One Voice, Text & 4G LTE Cell Phone Signal Booster for Vehicles that eliminates outside antennas and cable. SureCall Guardian3 QR SC-TriPSBS-8-QR, is 80 dB Public Safety Band Signal Booster Amplifier that services the full Public Safety 700 MHz (FirstNet Ready), 800 MHz, and 900 MHz SMR (Specialized Mobile Radio Service). SureCall machine-to-machine (M2M) 3G signal booster SC-SOLOI-15 kit. SureCall M2M amplifier application includes ATMs, Vending Machines, Lotto machines, and remote monitoring and more. M2M signal booster is FCC approved for use with all major carriers. SureCall SC-DualM-50-Kit Mobile Signal Booster Cellular 800Mhz / PCS 1900Mhz for AT&T, Sprint, T-Mobile and Verizon 2G, 3G data signal and voice. SureCall vehicle signal booster is FCC Certified for new regulations and technical standard. SureCall TriFlex cellphone signal booster for use with AT&T. Cellphone-Mate TriFlex tri-band adjustable cellphone booster amplifier for LTE 4G AT$T network. These booster kits provide enhanced 2G, 3G and 4G voice. SureCall Flexpro Tri-Band 4G LTE signal booster for use with ATT wireless network only. Flexpro signal amplifier specifically designed for AT&T 2G, 3G and 4G voice and data reception. FCC certified for new regulations and technical standards. SureCall Flexpro Tri-Band 4G LTE signal booster for use with Verizon wireless network only. Flexpro signal amplifier specifically designed for Verizon 2G, 3G and 4G voice and data reception. FCC certified for new regulations and technical standards. SureCall TriFlex cellphone signal booster for use with Verizon. Cellphone-Mate TriFlex tri-band adjustable cellphone booster amplifier for LTE 4G Verizon network. SureCall TriFlex2Go-A Mobile Signal Booster Cellular 800Mhz / PCS 1900Mhz / LTE 700Mhz for AT&T 2G, 3G voice and 4G data signal reception. SureCall TriFlex2Go vehicle signal booster is FCC Certified for new regulations and technical standards. SureCall TriFlex2Go-T Mobile Signal Booster Cellular 800Mhz / PCS 1900Mhz / LTE 700MHz for Verizon 2G, 3G voice and 4G data signal reception. SureCall TriFlex2Go vehicle signal booster is FCC Certified for new regulations and technical standards. SureCall TriFlex2Go-V Mobile Signal Booster Cellular 800Mhz / PCS 1900Mhz / LTE 700MHz for Verizon 2G, 3G voice and 4G data signal reception. SureCall TriFlex2Go vehicle signal booster is FCC Certified for new regulations and technical standards. SureCall TriFlex cellphone signal booster for use with AT&T. Cellphone-Mate TriFlex tri-band adjustable cellphone booster amplifier for LTE 4G AT&T network. SureCall Ultra Thin Antenna is a low-profile dome antenna for in-building cell phone signal boosters.